My name is Alan "Mr. Tricks" Tilove. I am a juggler with over 25 years' experience. A high energy, comedy juggling adventure that amazes everyone. The show is designed to be age appropriate. Mr. Tricks incorporates audience members in a positive light as his juggling partners, tossing all kinds of fun objects that can be found around the house. 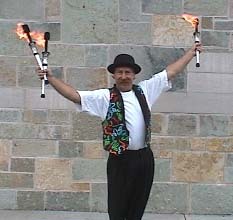 The juggling tricks that are performed by Mr. Tricks are exciting and numerous. He juggles hats, balls, spinning plates, clubs, Chinese yo-yo's, toilet plungers, boxes, and rings, and rides unicycle and rola bola. (Dangerous juggling objects are performed only upon request.) The show is generally 45 minutes long. Holding an MS degree, he can design his show to fit many diverse themes. The shows are always family friendly. Performing Area: Inside, outdoors, can fit into any space. Very adaptable. Fee: $150-300 plus travel. Two or more programs price negotiable. On Thursday nights you can usually find me at the Oregon Juggling Club in Oregon, Wisconsin.